There's been a bit of a tempest in a teacup lately about Barack Obama speaking to schoolchildren at the beginning of the school year. Let's not get into a debate on the merits of that event, but rather take a look back in time. Boy, people sure do have short memories these days! Good thing we have YouTube around to keep things real. And doesn't this particular incident violate some basic religious tenet about false idolatry? Like, say, #4 of the Ten Commandments? Gee, it sure seems like it did. What happens to those who violate that particular commandment? There's another commandment that deals with bearing false witness, but let's leave that one alone for a while. If the video above hasn't given you your daily dose of shudders or laughs, well, then please feel free to leave us a comment. By the way, this is real. It's an excerpt from Jesus Camp, the 2006 documentary that was nominated for an Oscar (best documentary feature). CARHYPE: VW and mileage for days! Volkswagen's L1 Concept was revealed at the Frankfurt Motor Show. "In many ways this 840lb, tandem-seat machine is the most important car at the show and just as much a supercar as the Lamborghini Reventón or Bugatti Sang Bleu. 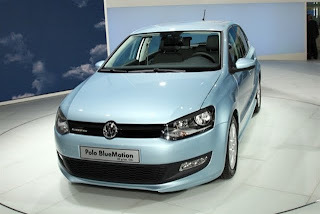 "The most efficient model of all, the Polo BlueMotion, gets an all-new 1.2-litre, three-cylinder common rail diesel engine developing 74bhp, combining longer gearing through the five-speed gearbox, a stop-start system and regenerative braking. Ernie Anastos...did he really say that? Watching the Military Channel today and this came on. Simply priceless! There's not much to add, except "good luck". UPDATE: Ann Minch, the woman who appeared in this video, was apparently successful with her own account. Bank of America called her and agreed to terms.